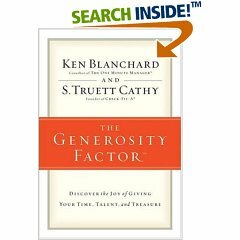 Just listened to an audio book on the way back from South Carolina called the Generosity Factor by Ken Blanchard and Truett Cathy and it was off the hook. I love redeeming drive time when I drive alone so I usually listen to books or leadership talks. I had this trip all planned out, it was two John Maxwell books (Winning Attitude and 360 Leader). I have been looking forward to these books for a while. Long story short, ipod dead, computer dead so I was forced to more primitive means of listening. I had some cd’s (yes they still make those) in my truck and the Generosity Factor was the winner (on a side note, I put the cd in when I pulled out of the driveway in SC. I changed to disc 2 in Lumberton and when I pulled into my driveway the book ended. Weird). I love Ken Blanchard books, they are usually parables and they keep my attention. This one was told in story form and was good. Here were some of the highlights for me. Thank Him (God) – This is a reminder that we are not at the center of our universe and we are not all that self sufficient. This book had a fresh perspective on Success vs. Significance and on using your time, talent and treasures generously. I too just recently finished reading “the Generosity Factor.” It supports my belief system and how we are suppose to find a social a problem and resolution while we are here. “Generosity Factor | Daryl Strickland”? I actuallygenuinely appreciated it!